There is a new restaurant just outside my place and we decided to go check it out over dinner a few Sundays ago. As we entered, we saw rows and rows of these red things. Wanna make a guess what they are? Find out the answer in the comments section. 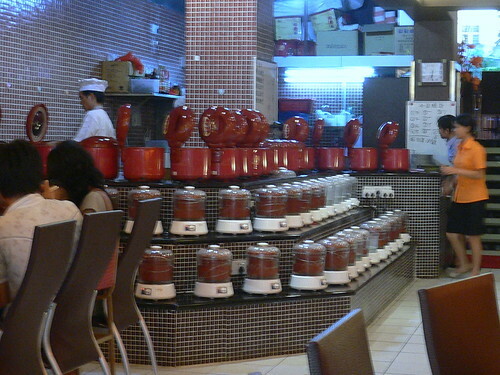 It is a claypot restaurant and the red coloured "buckets" are actually claypots. The glass receptacles in the lower rolls are claypot soup boilers whereas the ones on the top are claypot (hidden) rice cookers. Only difference here is that the clay in the claypot is of a different kind that the ones that we are more familiar with as in the picture below. The clay used here is known as Purple Clay (紫砂 or 朱砂) and we more often find them in the 泡茶 teapots that is especially popular among the older folks in Ta1wan. As the fare are mostly steamed and very little oil is used, the food is much healthier as most Spitland food are very heavy in oil. I fit is good, can share the venue? An: Yup, it sure does look like one of those "Liang Teh" shops. okiedokie: You already won me over when you said the word charcoal. Everything is nice when it is done over charcoal e.g. kaya toast. But the way I feel about this, granted that both are technically claypot, you cannot put the two together for comparison as they are apples and oranges. Both have they one distinctive characteristic. 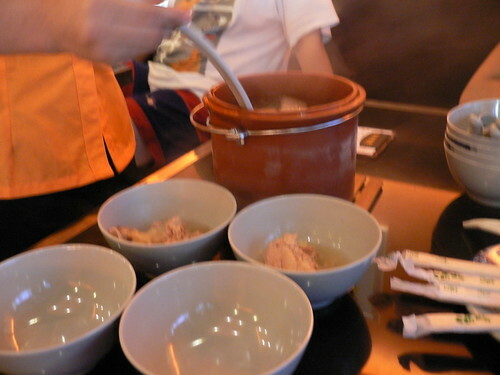 we can get both type here (aiyah, there are generally made in china also hahaha...) the bottom is essentially a double boiler for stewing soup. you can't get crispy charred rice when cooked with this methods, the heat is too gentle. Slurp! : My favourite is still the latter and I love especially the burnt part of the rice. I am so going to die of cancer from all the carcinogens I am consuming.